A common problem with electrodes is finding the right places to attach them for maximum relief and benefit when using a TENS unit for foot pain. It’s a process of trial and error – even for Doctors, Physical therapists and other health care professionals. This applies to EMS and other Neurostimulation modes as well. Using the Advanced Foot Energizer as a TENS and EMS unit for foot pain is marvelous for the simple reason it eliminates placement guess work and treats the entire area evenly. It’s the special plantar foot pads that allow the Energizer to perform as large foot fitting electrodes. The bottom of our feet is like a fuse box. There are several pressure points on the bottom of our feet and these pressure points are associated with other parts of out body. By stimulating the pressure points the body part associated with the pressure point is also stimulated. The Advanced Foot Energizer stimulates these pressure points while at the same time activating your circulation in your feet and legs. It is by far the easiest method of using a tens unit for foot pain. The foot pads on the Advanced Foot Energizer are divided into different areas that target individual parts of your feet. Chinese medicine traditionally refers to these areas as “foot meridians”. 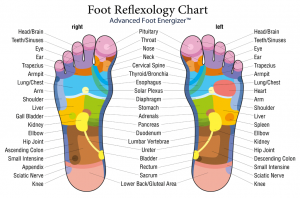 In reflexology, the understanding is that all the different parts of your body are connected to the soles of your feet. Stimulating the specific areas of the bottom of your feet can help to improve your overall health. Because it uses this unique combination of both Western and Chinese medicine techniques the Advanced Foot Energizer is an excellent choice for treating feet that are tired and painful. Please note that if you have neuropathy you may not feel the stimulation right away, even at full strength. Customers report either feeling the stimulation immediately to up to two weeks before feeling the sensation with consistent use. Take it at your pace but use it at lease once or twice per day for at least 25 minutes. Consistent use is the key; don’t expect to get the same results sitting down for two hours once a week as you would if you used the Advanced Foot Energizer 25 minutes every day. You may also use the body pads to apply stimulation concurrently to your calf muscles increasing the circulation even further. If you suspect you have or have been diagnosed with neuropathy visit with your doctor about using electrical stimulation for your feet. 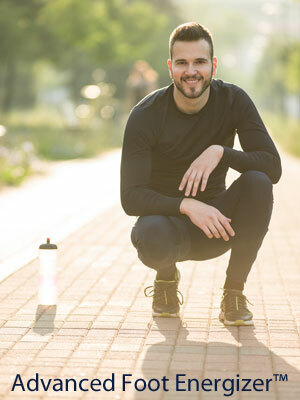 If you are a runner, hiker, or cyclist with foot and ankle pain then the Advanced Foot Energizer is the perfect tool for post workout recovery. It is relaxing and really eases pain from running on trails and roads. The body pads can be used to stimulate your knees or leg muscles at the same time as you are treating your feet, helping to condition your muscles and speed recovery time. Try the Advanced Foot Energizer risk free with our 60-day buy back guarantee and get back to running, cycling, hiking, or walking faster! Neuromuscular adaptations of the plantar flexor muscles were assessed before and subsequent to short-term electromyostimulation (EMS) training. Eight subjects underwent 16 sessions of isometric EMS training over 4 wk. Surface electromyographic (EMG) activity and torque obtained under maximal voluntary and electrically evoked contractions were analyzed to distinguish neural adaptations from contractile changes. After training, plantar flexor voluntary torque significantly increased under isometric conditions at the training angle (+8.1%, P< 0.05) and at the two eccentric velocities considered (+10.8 and +13.1%, P < 0.05). Torque gains were accompanied by higher normalized soleus EMG activity and, in the case of eccentric contractions, also by higher gastrocnemii EMG (P < 0.05). There was an 11.9% significant increase in both plantar flexor maximal voluntary activation (P < 0.01) and postactivation potentiation (P < 0.05), whereas contractile properties did not change after training. In the absence of a change in the control group, it was concluded that an increase in neural activation likely mediates the voluntary torque gains observed after short-term EMS training. Electrostimulation training effects on the physical performance of ice hockey players. Brocherie F(1), Babault N, Cometti G, Maffiuletti N, Chatard JC. 1. Med Sci Sports Exerc. 2005 Mar;37(3):455-60.
skating, and vertical jump performance of a group of ice hockey players. specific conditions were measured using an infrared photoelectric system. velocities) and short skating performance of a group of ice hockey players. The effects of electromyostimulation training and basketball practice on muscle strength and jumping ability. Maffiuletti NA(1), Cometti G, Amiridis IG, Martin A, Pousson M, Chatard JC. 1. Int J Sports Med. 2000 Aug;21(6):437-43.
this was not the case for low concentric velocities (60 and 120 degrees x s(-1)). Gondin J(1), Guette M, Ballay Y, Martin A. 1. Med Sci Sports Exerc. 2005 Aug;37(8):1291-9.
examined to analyze muscular changes. no changes occurred in the RF muscle. changes selectively involved the monoarticular vastii muscles. 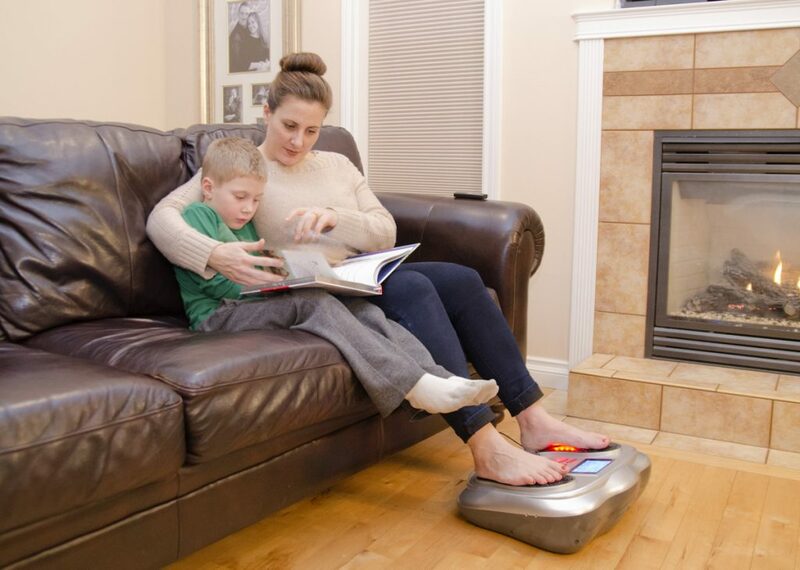 From the above studies we can conclude that using a tens unit for foot pain will not only reduce pain, but that ther are significant gains in muscle conditioning and strengthening as well.